ANCSA was the last Native land claim settlement in the continental United States. The long delay in settling Alaskan claims stems from Alaska's colonial history and its remote and marginal position with respect to the rest of the country. Colonial incursions by Russians did not begin until the 18th century, and these contacts were largely limited to the exploitation of coastal resources. Russian settlement was not a desired goal, and only 550 Russians lived in Alaska when it was sold to the United States in 1867. The Alaska Treaty of Cession, which transferred Alaska from Russia to the United States, acknowledged Native title. The Organic Act of 1884, which outlined the governance structure for the territory, contained even stronger language protecting Native rights. Growing encroachment by Americans, stemming from the gold and salmon rushes of the late 19th and early 20th centuries, brought Native Alaskans into conflict with the recent arrivals. The Tlingit and Haida peoples in the southeast part of the territory were especially affected and initiated a lawsuit in 1936. This suit sought compensation for millions of acres of lands withdrawn by the federal government for the Tongass National Forest. While the Tlingit-Haida claim was being adjudicated, the Alaska Statehood Act of 1958 further renewed the claim of continuing respect for Native rights established by use and occupancy. But far more important was the Act's direct assignment of more than 100 million acres of previously federal land to the new state. The Statehood Act required the state of Alaska to select, survey, and patent fully one-third of the land base. This imminent hardening of property rights signaled a major and rapid foreclosure of possible Native rights to these lands. Shortly after statehood the Court of Claims finally decided the Tlingit-Haida case. The court held that the land withdrawal did in fact constitute acquiring formerly occupied lands and required compensation. However, the compensation was finally established (eight years later) at only 50 cents per acre based on nominal values as of the purchase from Russia in 1867. The decision shocked many Native Alaskans into the realization that established judicial channels would not bring meaningful amounts of land or even cash assets into indigenous hands. Yet it also provided an important legal precedent by accepting the link between traditional subsistence use and occupancy of vast land areas and the lawful claim to that land. By this standard, Native Alaskans had a valid claim to all of Alaska. During the early 1960s, the encroachments on traditional Native lands accelerated, often involving grand development schemes and increased enforcement of federal hunting restrictions. In 1961, the Atomic Energy Commission proposed using atomic weapons to blast a harbor out of the bluffs at Cape Krusenstern on the Northwest coast. Shortly thereafter, the Bureau of Reclamation and Army Corps of Engineers developed plans to build a huge dam on the Yukon River that would have flooded many villages and subsistence habitats. These regional conflicts might have remained isolated pockets of ineffective complaints in a vast territory, but for three significant factors. generation of college-educated leaders was emerging from school, creating an instant and unprecedented leadership class and a statewide network of personal relationships among these leaders. Equally important, these leaders found a sympathetic source of private funding to support a statewide, Native-controlled newspaper, the Tundra Times. This newspaper was the first means of mass communication available to Alaska Natives, since at the time there was essentially no television reception, radio was dominated by localized commercial broadcasters, and telephone connections were tenuous or nonexistent. The second factor was an administrative legal action taken in 1966 by US Secretary of the Interior Stuart Udall. Concerned that the 1884 Organic Act had sidestepped the legitimate rights of Native Alaskans, Udall placed a freeze on all transfers of disputed land. This action effectively halted all transfers to the state of Alaska and created immediate pressure for Congress to resolve the Native land claims issue. Although an administrative action, the freeze was extended past 1968 when Senator Henry Jackson agreed to give the Alaska Federation of Natives (AFN) veto power over President Nixon's appointment of Walter Hickel as the new Interior Secretary. Hickel extended the land freeze as the price of his approval by AFN. 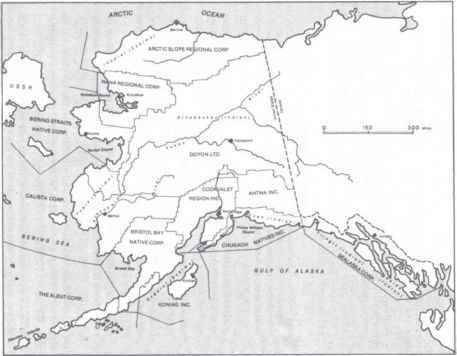 Alaska Native Regional Corporation boundaries. Published in The Alaska Native Claims Settlement Act, 1991, and Tribal Government, ISER Occasional Papers No. 19, Institute of Social and Economic Research, University of Alaska Anchorage. reserves, producible at a rate equal to about 20% of existing US oil production. This discovery dramatically raised the stakes of the bargaining game for all parties. Although Native Alaskans never asserted title to the oil field itself, the oil required transportation across 700 miles of contested federal lands to reach the icefree port of Valdez. With a daily production of two million barrels at stake, the discovery would produce revenues of about $6 million per day. Because the field was located on state land, it promised billions of dollars in royalties as well as oil company profits. Equally important, the Prudhoe Bay discovery changed the perceptions of what a claims settlement could accomplish. Alaska, which had been poor, would now be rich. If there were additional sources of such huge rents lurking in everyone's backyard, then the economic development problem was reduced to distributing endowments. Native Alaskans could get rich too. Seeing the coming speculative boom fueled by such a huge discovery, many prescient business-people realized that putting land into Native hands was a far faster route to exploitation than leaving it in federal public domain or even passing it to the state. Business opposition to a settlement began to soften. Most important, it was the oil discovery that allowed the Native land claims movement to be merged, in the eyes of Congress, with the Native economic development problem. 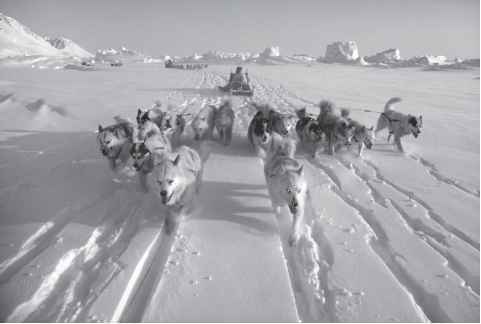 Alaska Native underde-velopment in 1968 was severe by any standard. In the socially tumultuous climate of the late 1960s, the Alaska Native land claims issue presented Congress and the nation with a chance to make more enlightened, or at least more compassionate, Indian policy than had been imposed on the tribes of the lower 48 states.